1. Put the pine nuts in the bowl of a food processor and blitz until roughly ground. Remove and set aside. Blitz the basil and garlic, then, with the motor running, pour in the oil until you have a bright green paste. Remove from the food processor and stir in the pine nuts and parmigiano reggiano; season. 2. Cook the spaghetti according to packet instructions. 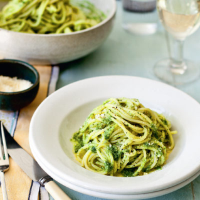 Reserve a cup of the cooking liquid, then drain the pasta and stir through half the pesto, adding a little cooking liquid to loosen. 3. Serve with extra parmigiano reggiano, if liked, and a green salad on the side.